production BMW ever  is out now. 'LARGE', AS FAR AS THE NEW M6 GOES, refers to image, size, price and performance. Price first: the 552bhp M6 Coupe costs �,820; the Convertible �,020. Of course, these figures are just a starting point: most M buyers take most of the options  �7,000 should cover it. The good news is that also buys you some exclusivity because in a full year only about forty M6 Convertibles and sixty M6 Coupes will be sold in the UK. 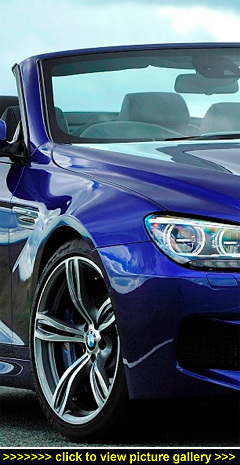 The platform of the new M6 is totally new, with the drivetrain utilising the turbocharged, high-revving, 4.4-litre V8 petrol engine, seven-speed double clutch automatic transmission (with variable shift programmes and launch control), and M multi-plate limited slip rear differential of the amazing M5 saloon. This 552bhp twin-turboed, direct injection powerplant not only produces 52bhp more than its ten-cylinder predecessor, but it also benefits from a greatly improved torque output over a broad rev-band. It's this 501lb ft of torque (available from as low as 1,500rpm through to 5,750rpm) that not only gives the new M6 its stunning outright acceleration but also its commanding on-road flexibility. Both versions have a top speed limited to 155mph; 0-62mph takes just 4.2 seconds for the M6 Coupe and 4.3 seconds for the M6 Convertible. This marked increase in performance has gone hand-in-hand with significant improvements to fuel consumption and emissions. With the adoption of BMW's EfficientDynamics technology, the efficiency of the engine is further improved by, amongst other things, Auto Start-Stop, Brake Energy Regeneration, and Active Aerodynamics. The result is a 30% reduction in both fuel consumption and emissions: the M6 Coupe has a combined fuel consumption of 28.5mpg (Convertible 27.4mpg), with CO2 emissions of 232g/km (Convertible 239g/km). Bearing in mind the purchase price of the M6, the cost of the road tax is almost of no consequence but, for the record, both versions have a First Year road tax charge of �5, reducing to �0 for the second year onwards. Company car driving executives will pay the maximum 35% rate of Benefit-in-Kind tax. Over the standard 6-Series, the new M6 has a sportier styling treatment that underlines its role as a fast, luxurious and visually imposing 2+2 Cabriolet or Coupe. At the front, a new M apron with wide air-intake apertures provides the necessary cooling for the engine, while sharply contoured headlamps feature the characteristic BMW 'Corona rings'. The new M kidney grille, with its black slats and shape inspired by the double-spoke alloy wheels, further enhances the nose. To the side, a 30mm increase in the front track has resulted in a significant swelling of the front wheel arches, with the familiar M gills behind them featuring chrome flares and indicator bars with the M logo. At the tail, the now-traditional twin pairs of exhaust pipes sit either side of the aerodynamically-optimised diffuser. As standard, the new M6 comes with 19-inch alloy wheels featuring seven double spokes in a two-tone finish. One of the must-have options for most buyers  although they firm up the ride comfort  are 20-inch alloys with five double spokes. Coupe versions once again use a carbon-fibre reinforced plastic roof panel which lowers the car's centre of gravity and, as a result, improves handling agility. Convertible M6's feature the same high-quality as the 6-Series Convertible and the heated vertical glass rear window retracts independently of the roof. A button on the centre console operates the soft-top, and it can be raised and lowered at speeds of up to 25mph. Just 19 seconds is all it takes to lower the roof; 24 seconds to raise it once again  probably the slowest thing about the M6 Convertible! I had a very brief  but swift  test drive this week at the BMW media launch using the winding roads of West Sussex, where leisurely driving prevails... Of course, the acceleration is absolutely stunning, as you'd expect from the fastest production BMW ever. Why buy one? Refined styling, opulent and luxurious cabin, stunning performance, epic to drive. Why not? Tight rear space, pricey.